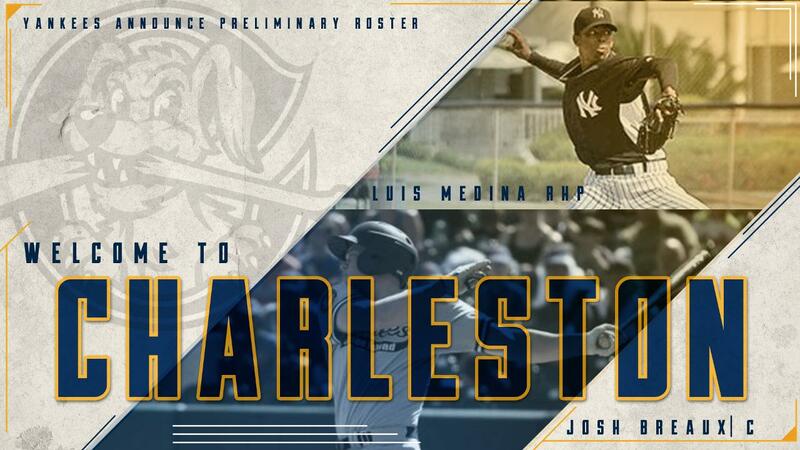 CHARLESTON, S.C. - The New York Yankees' impressive crop of young arms once again highlight the RiverDogs roster as a host of hard-throwing right-handers are among five of the Yankees' top-30 prospects currently slated to open the season with Charleston. Hard-throwing righties Luis Medina (Yankees No. 8 per Baseball America, No. 11 per MLB.com), Roansy Contreras (No. 7 MLB.com, No. 18 BA), and Luis Gil (No. 20 MLB.com, No. 25 BA) will headline another impressive Charleston staff that has finished top-2 in the South Atlantic League in ERA the past three seasons. Behind the plate, power-hitting backstop Josh Breaux (No. 14 MLB.com, No. 30 BA), the Yankees' second-round pick last summer, will work with the talented staff as he breaks camp for his first full season as a professional. Charleston's roster features plenty of fresh faces as the Dogs begin their hunt for a third playoff appearance in the past four years. Eight players return from last season's 64-72 squad, but only three who spent more than 10 games in a Charleston uniform: outfielder Frederick Cuevas (55), catcher Eduardo Navas (54), and RHP Dalton Higgins (24). With the season set to begin in less than a week, the RiverDogs roster as announced by the Yankees is subject to change in advance of Thursday's opener on the road in Columbia. An all righty staff to begin the season, pitching coach Gabe Luckert's group of talented pitchers won't be lacking in velocity as the RiverDogs feature several lively arms set to open the 2019 campaign. Contreras, 19, impressed in his seven-game stint with the Dogs last year, posting a 3.38 ERA while fanning 28 batters in 34.2 innings despite failing to garner his first Class A win. The Dominican Republic native dominated the New-York Penn League, posting a sub-2.00 ERA with Staten Island to begin the season. After being called up for a July 23 start, the then 18-year-old became the youngest pitcher to throw a pitch for the RiverDogs since Manny Baneulos in 2009. Medina, 19, features some of the most electric stuff in the Bronx Bombers system, showcasing a fastball that routinely touches triple digits. His fastball and curveball are both rated as the best in the organization by Baseball America heading into the year. The D.R. hurler showcased his dominance by racking up 47 strikeouts in 36 innings with rookie-level Pulaski last year, although it also came along with 46 walks and an ERA over 6.00. Gil, 20, impressed in his first season as a Yankee farmhand in 2018, posting a miniscule 1.96 ERA in 12 starts between Staten Island and Pulaski, a stretch when he fanned 68 hitters in 46 innings. The Dominican arm was previously acquired in a trade with the Minnesota Twins for former RiverDogs outfielder Jake Cave. Newcomers to the Charleston staff, righties Daniel Bies , Rodney Hutchison , Aaron McGarity , Tanner Myatt , and Matt Sauer (Yankees No. 17 MLB.com, No. 10 Baseball America) all earn assignments after serving as staples in Staten Island's staff in 2018. A product of nearby Florence-Darlington Tech, Myatt topped out at 99 while at the South Carolina-based program and proved an intriguing late-round pick for the Yankees after fanning nearly 11 batters per nine, despite a 5.40 ERA, in his pro debut. A second-rounder out of high school in 2017, Sauer enjoyed a bounce-back campaign in 2018, posting a 3.90 ERA in 13 starts with the SI Yanks. Right-handers Shawn Semple and Alexander Vizcaino both start the season in RiverDogs uniforms after combining for three starts with Charleston to finish out solid 2018 seasons at the lower levels. Semple garnered South Atlantic League Pitcher of the Week honors after racking up 17 strikeouts and yielding just two runs in 12 innings over a pair of starts. Adonis De La Cruz will make his debut with the Yankees organization after striking out over 11 batters per nine while in Seattle's system before being selected in the minor league phase of the Rule 5 draft by New York last year. Jio Orozco and Dalton Higgins round out the staff, both coming off more lengthy stays in the Lowcountry last season. A mix of raw talent and experience, Breaux and Navas form the backstop tandem for the Dogs to begin the year. The Yanks' second-round pick last year, Breaux got his feet wet in pro ball with a 27-game stint with the Staten Island and GCL Yankees, batting .280/.295/.370 with 13 RBI. The former two-way player was one of the most dominant Junior College hitters available in the 2018 draft; he finished his sophomore season ranking among the top-20 in the JUCO ranks in slugging (.831), on-base percentage (.532), and home runs (18) with McLennan College in Texas. Navas, 22, begins what will be his fourth season with the RiverDogs. In 146 games with Charleston, the Venezuela native has hit .192 while throwing out 46 percent of would-be base stealers (76-for-166) from behind the dish. Collegiate products will pepper the RiverDogs infield to start the year with Max Burt (Northeastern), Mickey Gasper (Bryant), Kyle Gray (West Virginia), and Eric Wagaman (Orange Coast CC) all mixing and matching alongside Dominican Nelson Gomez and Venezuela native Eduardo Torrealba to open the season. Despite leading the Appalachian League in strikeouts, Gomez flashed plenty of pop in Pulaski's lineup last season, finishing in the top-5 in the circuit with his 11 home runs. Speed won't be at a premium in the Charleston lineup to start the season with Brandon Lockridge (Troy) and Isaiah Pasteur (George Washington) providing elite quickness among an exciting RiverDogs outfield corps. The Yankees' 5th and 13th round selections last year, respectively, were tabbed as 80-grade runners by Baseball America although they only combined to swipe nine bags during their pro debuts. Cuevas and another Yankees trade acquisition from the Mariners, Josh Stowers (Louisville), round out the group in the outfield. Stowers, 22, will add more speed to the Charleston lineup after swiping 20 bases and garnering Northwest League Mid-Season All-Star honors while with the M's Short Season club last year. With a tentative roster set in advance of Opening Night, the RiverDogs will face the Myrtle Beach Pelicans, the Advanced-A affiliate of the Chicago Cubs, in an exhibition contest on Tuesday at 6:30 p.m. at TicketReturn.com Field before opening the season on the road on Thursday, April 4 in Columbia. Tuesday's exhibition contest will be broadcast online at riverdogs.com and via the TuneIn Radio app. Thursday's opener and all regular season contests can be tuned into on "The Big Talker" WTMA 1250 AM in the tri-county area. Fans can "Make Fun" with the RiverDogs all season long when they open their home slate on Thursday, April 11 against the Greensboro Grasshoppers to kick off a weeklong homestand at The Joe. Single-game tickets, including options to the Riley Park Club, are now available at riverdogs.com/tickets or by contacting the RiverDogs front office at 843-577-3647 (DOGS). A full schedule and list of game times for the 2019 season is available at riverdogs.com.